Nikki's Fashion 411: Spring is here! Kind of.. It is finally Spring! Although, the weather in Jersey hasn't gotten the memo yet.. 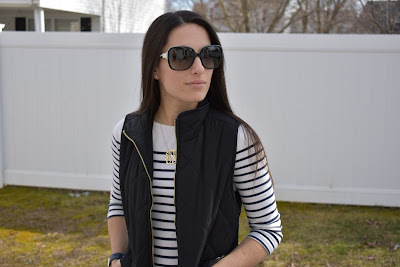 Here is a transitional outfit to get in the Spring spirit! What I love most about vests are that they can be used not only in the Winter, but also Fall and early Spring. They really add something to a plain outfit! I have also been wearing these Lucky Brand boots all winter long and I must say they are super comfortable. They are also great quality, I wear them almost every day to work and they have held up all winter without looking extremely worn in. As much as I love my booties I am so ready for sandals!